must be safe, engaging, and easy to use. Baby walkers are popular pieces of baby equipment that parents use for helping keep their little ones occupied and engaged whenever they have to do something that takes both their arms. Activities such as cooking, helping another sibling and cleaning are difficult to do while holding an infant. With a baby walker, the child can sit in the walker and be upright so they can look around at the world around them. Most baby walkers have an array of colorful and musical toys on the tray for even more entertainment. Despite the name baby walker, these pieces of equipment are not supposed to be used for walking or teaching the baby to walk. These top rated baby walkers are perfect for your child, ages 6-12 months of age. They should be able to hold their heads up well before they are put in the walker. This functional baby walker is a great combination of baby walker and high chair. 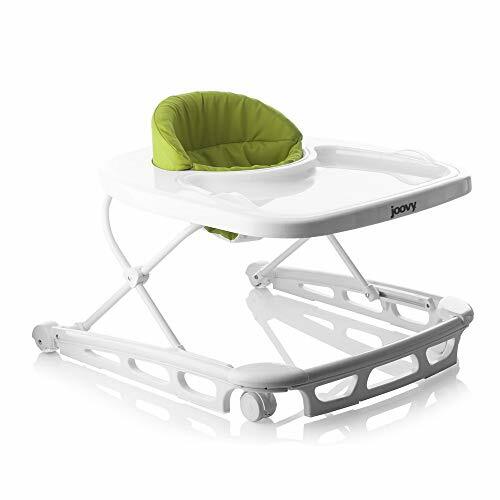 The Joovy Spoon Walker provides your baby with a balance of playing, physical development and eating all in one piece of equipment. The super sized tray has a removable insert that can be taken out and cleaned easily. It is dishwasher safe too. Once they are done eating, you can wipe it down and use that super sized tray for all of their toys. The high gloss finish of this bright, white baby walker is easy to keep clean and sanitized for your baby. The ultra wide base provides stability, mobility and safety too. Because the base is so wide, the baby won’t get their fingers pinched if they mover the walker into a wall or close piece of furniture. The seat pad is comfortable to sit on, is machine washable for your convenience and is made from 600D material. This material is luggage grade and very durable. The high back on the seat provides your baby with plenty of support while they are groping up. The adjustable height positions are just right for a child who can sit upright without help and who weigh less than 30 pounds and are 33 ½” high or less. It is constructed with steel reinforcement and has oversized wheels that make it easy to maneuver. Choose from three different height settings which make it a great fit no matter where you are. Storage is never a problem with Joovy. It folds flat making it easy to store and easy to travel with as well. It meets or surpasses all government standards so parents can have peace of mind as well. No assembly is required; all you do is take it out of the box and install the seat pad and it’s ready for the baby. It is made entirely from BVC, PVC and Phthalate free. It is also JPMA certified. Your baby will have a comfortable place to sit and play with the padded seat and rounded design of the Chicco Lil Piano Splash Walker. With 3 different height settings, you can adjust it to fit the height of your child for maximum comfort. The 6 brake pads are a great safety feature that help prevent fall on any stairs that are around, but please don’t rely on the pads exclusively. While your baby is in the walker, please supervise the baby at all times when it is in the walker. Made of plastic, steel and nylon, this baby walker is durable and with the proper care can last through several babies. The Chicco Baby Walker features a keyboard, drums, and a multitude of buttons, lights, sounds and toys too. Your baby will have plenty to see and do when they are in the Chicco Baby Walker. The music provides mental stimulation and development for young ones who almost always all love music. You won’t have to worry about storage space, as the Chicco Baby Walker can fold flat for the maximum amount of space saving convenience for traveling as well. The seat liner is easily cleaned and sanitized thanks to being removable so you can take it off, clean it and put it back, ready for the next playtime. 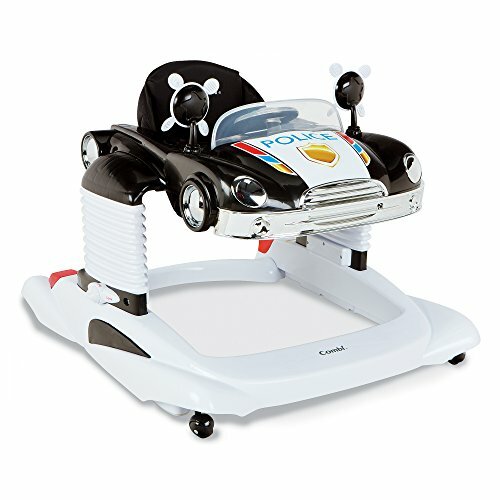 This adorable baby walker looks just like a little police car and providing an entertainment area for your little police officer. This baby walker has a three height adjustment option and can be a walker or lock it down with the lockable jumper feature and use it as a stationary jumper. This walker has an electronic play tray that provides the baby with all kinds of fun sounds, lights, mirrors, toys and activities to stimulate their creativity and enhance mental development. The car hood is removable and creates a large tray fort snacks and Sippy cups or you can spoon feed them a meal while they sit in it as well. This uniquely designed baby walker will provide your little one with months of entertainment from the time they are 4-6 months old until they start walking. With the proper care, it will last through multiple babies, providing the same stimulation, fun and entertaining space for them for years to come. It’s important to remember that baby walkers are not meant to teach your baby to walk. They are strictly for entertainment and encouraging them to interact with things in front of them. It also gives them the opportunity to be sitting upright in a supported position, safely. These top rated baby walkers have what every parent needs for a good quality baby walker. They have secure frames, plenty of room on the tray for toys or even to eat, and they are comfortable and perfect for an infant to get some time upright, rather than just on their backs or tummies. Our baby walker buyer’s guide will give you more detailed information on baby walkers in general. With the right information that tells you how to choose the right walker from many different choices, you will not have to worry about simply having to guess which one is the best for your needs. A confident decision will result in a purchase you are happy with and will remain happy with for years to come as other children use the special baby walker you’ve chosen. There are many new pieces of baby equipment that a new parent purchases in preparation for their little one’s arrival; items such as cribs, strollers, high chairs and a very popular one, the baby walker. A baby walker is a special seat that is attached to wheels via a special frame. This frame is usually made of heavy duty plastic with metal casters. Some baby walkers may have steel frame supports but for the most part, they are made of plastic so they are not too heavy for the baby to move. Baby walkers are perfect for babies that are old enough to sit upright unassisted. They need to be able to strongly hold their own heads up. Baby walkers are not designed to teach babies how to walk sooner. They are designed to be places to safely allow them to sit and explore their worlds around them from an upright vantage point. They should not be a replacement for being out and about in the room, supervised at all times, learning to pull themselves up against a couch or chair and taking those first few steps. Despite the fun and entertainment that a baby walker offers your baby, there are some potential dangers that can be present that every parent needs to watch for. One of the main reasons baby walkers has the potential to be so risky is that mobility can be a little too good. The baby will be able to move around and access areas they would not normally be able to if they were lying on a blanket. A baby’s lower legs will be strengthened with the use of a walker but since they would not be crawling or squatting as much, their hips and upper legs can be much weaker than babies that spend little time in the walker once they start pulling up. Walkers are meant to provide activities and entertainment for a baby, not replace being on the floor and developing their muscles and joints. Make sure that the baby walker you buy meets all product safety standards and avoid buying used walkers. The new walkers on the market have to be up to date on their standards which ensure a safer product for you. Two of the most common product standards for a baby walker to have are that the walkers are wide enough not to fit through doorways and that there are stop/safety mechanisms that will stop the walker at the edge of any stairs. Even if the walker has the stop mechanism, it is important to install a permanent safety gate at the top of any stairs to prevent injuries and accidents. There are many features that you want to look for when it comes to choosing a baby walker. These features make the baby walker even more valuable to parents of infants. When you start researching and shopping, make sure to look for the features below. Friction strips – These strips will touch the floor if the wheels of the walker reach the edge of stairs or uneven pavement which could cause the baby walker to tip over, causing harm to the baby. Most of the walkers on the market have these friction strips but they are NOT fail safe and should not be used as a primary safety measure around stairs or uneven ground. Seats – There are several different features regarding the baby walker’s seat that can be offered. Removable seat covers that are machine washable, adjusting heights where the seat can be lowered and raised as needing, and locking wheels to prevent the walker from being able to be rolled around. 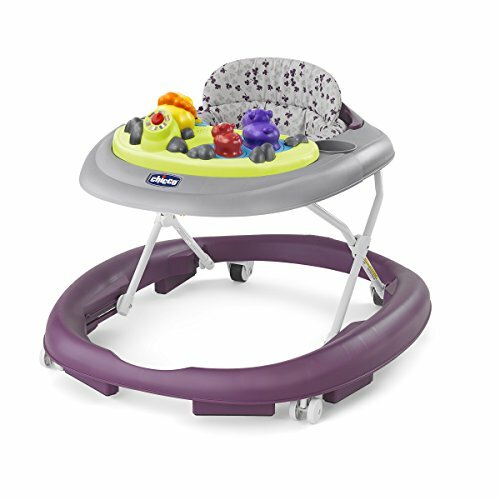 Toys – Most walkers have trays with rims on them that can be used for feeding the baby snacks as well as being a place they can play with toys. In many cases those trays are equipped with a variety of toys that will either be attached to the tray or that can be attached and removed as needed. These toys may have electronic components that have lights and music as well. Foldability – Storage space is a valued commodity for some parents, so having a baby walker that is foldable is a real benefit when space is at a premium. Most walkers on the market will have a little mechanism that when pressed will allow them to fold flat. This makes it easier to store and transport. Locking Bounce Feature – Some if the walkers on the market have a spring systems inside that allows them to bounce when in the locked position. If the baby doesn’t feel like bouncing, that feature can usually be locked so the seat is still. Whenever you have a baby old enough to be mobile, you want to make sure that you have childproofed the area that they will be in. Putting them in the baby walker does not guarantee safety, especially if they are old enough able to move the walker around. Do these steps below before allowing your baby to be in the walker. Your baby should not be in a walker near any stairs regardless of whether the baby walker has friction strips or not. These are not a failsafe method of protecting the child from going down the stairs accidentally. Any and all staircases need to have a safety gate installed properly to avoid falling whether in the walker or not. Don’t rely on the spring loaded safety gates that use tension to stay upright. These can be pushed down by a child in a walker. The child should be confined to one room at a time when in the walker and an adult needs to be in the room they are in at all times. It takes just seconds to pull something down on top of them or to get injured. Whenever your baby is in the baby walker, you will need to be on alert the whole time. Since the baby is able to move around, they will be able to reach things that would normally not be in their reach. Things like a pot on a stove or a lamp on an end table are now within reach with the baby in the baby walker. Never use a baby walker around swimming pools, rivers, lakes, oceans or any other water source that they can fall into. If you have the baby in the walker outdoors, an adult should be there at all times to make sure that there are no animals around that could cause problems. Remove items from tables, counters and stove tops that can possibly be reached by the baby when they are in their baby walker. Things like letter openers, knives, figurines, lamp cords and TV cords can also pose a risk. Any springs or hinges on the baby walker should have protective coverings to avoid the baby getting pinched. Don’t carry the baby in the walker from room to room or up and down stairways. It is easy to lose your balance with the bulky weight and fall. Once your child can walk on their own, or they reach the weight restriction from the manufacturer, they should not be put in the walker any longer. Don’t leave your baby in the baby walker for hours on end. 20 minutes at a time broken up throughout the day is better and allows the baby to work on their development on the floor as well. Regularly check the baby walker for any damage, broken parts or problems. If any appear, immediately stop using it. Make sure that you put the baby walker together properly by following the instructions carefully. Always buy a baby walker new. Buying a used one puts you at risk of using one that has problems or that has even been recalled in the past. None of the new baby walkers on the market will have any recall issues that are not immediately dealt with so you would know immediately. Following all of the safety measures above when it comes to using a baby walker will ensure that it is a positive experience for the baby and the parents. Baby walkers are still popular places to put the baby so they can play and be upright before they are walking. Despite the potential risks that can be present, when safety procedures are followed, they make safe and enjoyable places for your child to spend some time. The top rated baby walkers featured here are all excellent examples of the kind of baby walker you want to have for your child. They are customer favorites because of their sturdy construction, numerous features they offer and safe designs. Your baby will enjoy spending some time in their baby walker and exploring their world from the upright position even if they can’t walk yet.